My father’s good to me. *For Younger Children* Read “Father’s Day Detective”. Make a list or draw things you love about your Dad. Testify of the divine role of Fathers. Father’s Day was coming and I didn’t have a clue what to give my dad. What could he need that he didn’t already have? I decided I had to become a detective to find out. When Dad came home from work, I was ready. I had a small notebook and pencil to write down clues. I listened carefully and watched closely everything that happened. First, my dad walked in the door and said, “I’m home.” My mom said, “Welcome home, dear,” and gave him a kiss. Then Dad put his briefcase down by the bookcase. He took some coins and keys from his pockets, and put them on a shelf. Then he took off his coat and tie and hung them in his closet. He rolled up his sleeves and washed up for dinner. After dinner, Dad cleared the table and washed the dishes. Then he read the newspaper and listened to music. After family prayer I went to bed, still clueless about what my dad needed. The next morning I decided to try again. I got out my notebook and watched. It wasn’t long before I finally had the clue I’d been looking for. First, Dad came into the kitchen tying his tie. He said, “Good morning, everyone,” and took a sip of orange juice. “I’ve got to hurry today,” he said. He was putting the coins back in his pocket when he stopped and looked around. “Have you seen my keys?” he asked me. I jumped up and found them on the floor near the bookcase. He waved good-bye, and I returned his wave with a big grin. I was happy because now I knew exactly what to make my dad for Father’s Day. I asked my mom for a clean, empty tin can with the top removed. She made sure there were no sharp edges. I covered the outside of the can with gold paper. From some old magazines I cut out pictures of things that had to do with money and keys—a piggy bank, a treasure chest, a door lock, and a sports car. I glued the pictures onto the gold paper. My mom then sprayed the can with a clear sealant. While I waited for the can to dry so I could wrap it, I made a card for my dad with a drawing of a detective on it. On Father’s Day, when Dad opened my gift, he looked confused. “This is a very pretty tin can,” he said. My dad used that tin can every day after that. Whenever I heard the familiar clatter of coins and keys, I felt happy inside. That sound meant my dad was home. And I felt a surge of love for him, knowing that I had been able to give him something he really needed. All I had to do was open my eyes and look for the clues. Make a list or draw things you love about your Dad. Testify of the divine role of Fathers. *For Teenagers or Adults* Read the excerpt from Elder Ballard’s Priesthood Session Address, October 2009. Watch “A Father Indeed”. Discuss and express gratitude for your father. Acknowledge the fact that we all have a Heavenly Father who loves us. Testify of the divine role of Fathers. Read the following excerpt from Elder Ballard’s October 2009 Conference Address in the Priesthood Session. Although his words were addressed to the Aaronic Priesthood, his advice is applicable to all of us as we honor our father’s. Discuss and express gratitude for your father. Acknowledge the fact that we all have a Heavenly Father who loves us. In a bowl, combine the brownie mix, oats, 3/4 cup of cream and egg in large bowl and mix well. Mix in chocolate chips or chunks. Drop large tablespoonfuls of brownie mixture on to greased cookie sheets. Yields approximately 16 cookies. Bake for 10 to 12minutes or until set. Cool 2 minutes; remove from cookie sheets to cool completely. Whip the remaining 1 1/2 cups whipping cream and powdered sugar in medium bowl; beat on high until stiff peaks form. To make the shortcakes, place 1 brownie cookie on each individual dessert plate or shallow bowl. Top each with strawberries, whipped cream and another cookie. 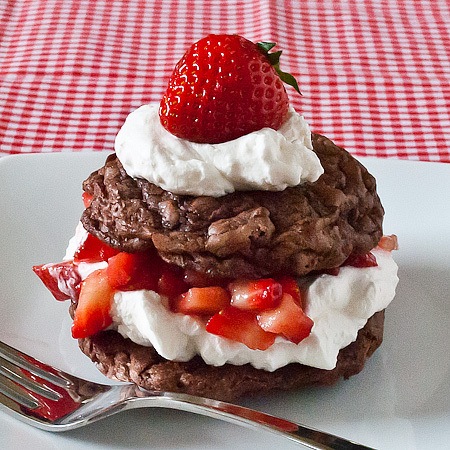 Top each stack with dollop of whipped cream and a little strawberries. 3.Coat one side of each flour tortilla with melted butter (or butter flavored cooking spray). Sprinkle tortillas with desired amount of cinnamon sugar. Using a pizza cutter, cut each tortilla in half and then cut each half into 4 wedges. Arrange in a single layer on a large baking sheet. (if using cooking spray, spray tortillas again with cooking spray). 4.Bake in the preheated oven 8 to 10 minutes. Repeat with any remaining tortilla wedges. Allow to cool approximately 15 minutes. 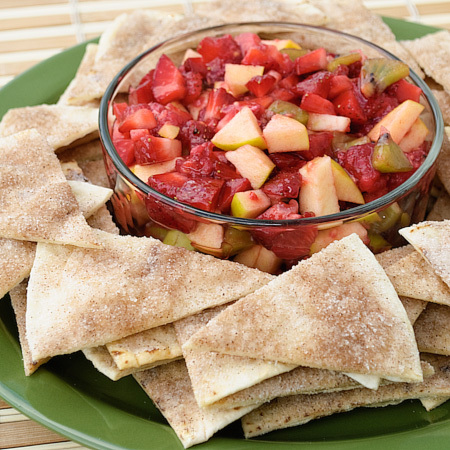 Serve with chilled fruit mixture. Best when made and eaten the same day otherwise the fruit gives off so too much juice and it gets runny. Serves around 5-6. 1- Write letters/make cards for your Fathers, Grandfathers, and other special men in your life. 2- Play your Dad’s favorite game!